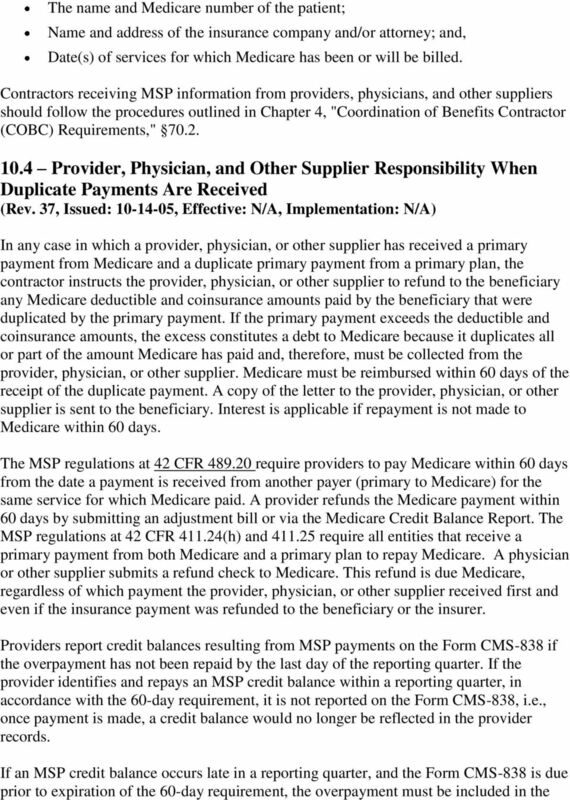 Download "Medicare Secondary Payer (MSP) Manual Chapter 3 - MSP Provider, Physician, and Other Supplier Billing Requirements"
8 credit balance report. 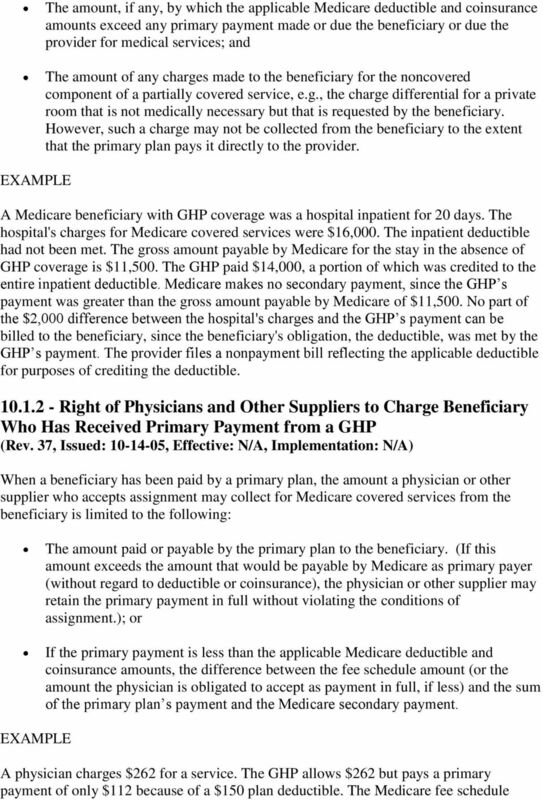 However, payment of the credit balance does not have to be made at the time the Form CMS-838 is submitted, but within the 60 days allowed Incorrect GHP Primary Payments A GHP may advise a provider, physician, or other supplier that the GHP believes that Medicare may have been the proper primary payer for services for which the GHP had previously made a primary payment. 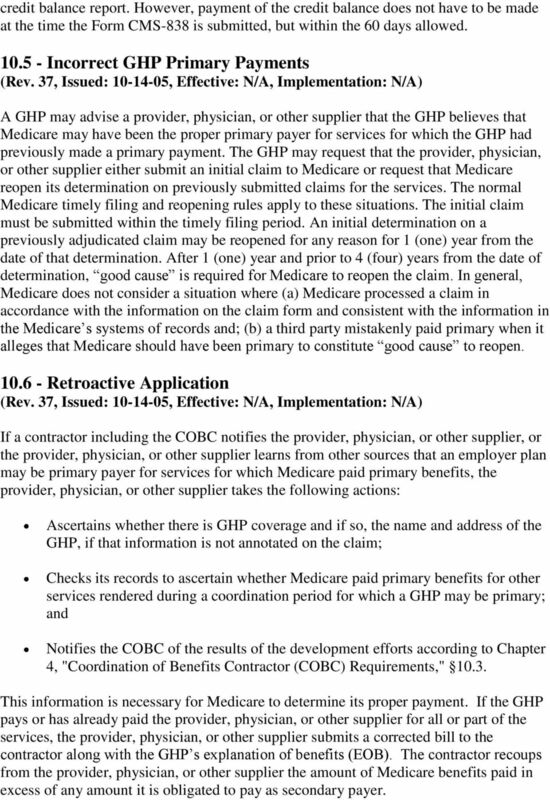 The GHP may request that the provider, physician, or other supplier either submit an initial claim to Medicare or request that Medicare reopen its determination on previously submitted claims for the services. 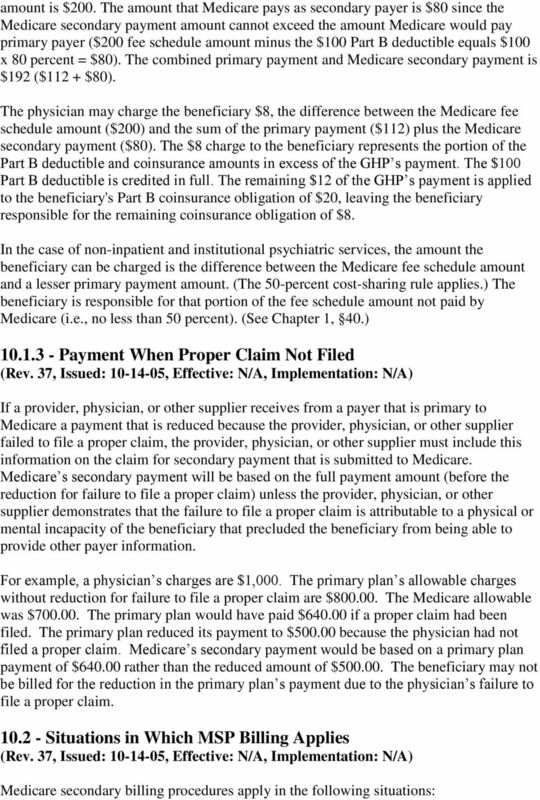 The normal Medicare timely filing and reopening rules apply to these situations. The initial claim must be submitted within the timely filing period. An initial determination on a previously adjudicated claim may be reopened for any reason for 1 (one) year from the date of that determination. After 1 (one) year and prior to 4 (four) years from the date of determination, good cause is required for Medicare to reopen the claim. 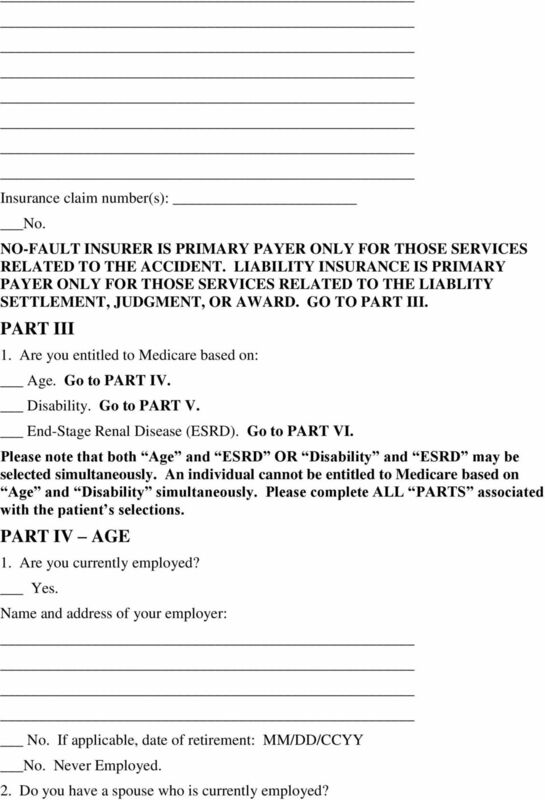 In general, Medicare does not consider a situation where (a) Medicare processed a claim in accordance with the information on the claim form and consistent with the information in the Medicare s systems of records and; (b) a third party mistakenly paid primary when it alleges that Medicare should have been primary to constitute good cause to reopen Retroactive Application If a contractor including the COBC notifies the provider, physician, or other supplier, or the provider, physician, or other supplier learns from other sources that an employer plan may be primary payer for services for which Medicare paid primary benefits, the provider, physician, or other supplier takes the following actions: Ascertains whether there is GHP coverage and if so, the name and address of the GHP, if that information is not annotated on the claim; Checks its records to ascertain whether Medicare paid primary benefits for other services rendered during a coordination period for which a GHP may be primary; and Notifies the COBC of the results of the development efforts according to Chapter 4, "Coordination of Benefits Contractor (COBC) Requirements," This information is necessary for Medicare to determine its proper payment. If the GHP pays or has already paid the provider, physician, or other supplier for all or part of the services, the provider, physician, or other supplier submits a corrected bill to the contractor along with the GHP s explanation of benefits (EOB). The contractor recoups from the provider, physician, or other supplier the amount of Medicare benefits paid in excess of any amount it is obligated to pay as secondary payer. 9 20 - Obtain Information From Patient or Representative at Admission or Start of Care (Rev. 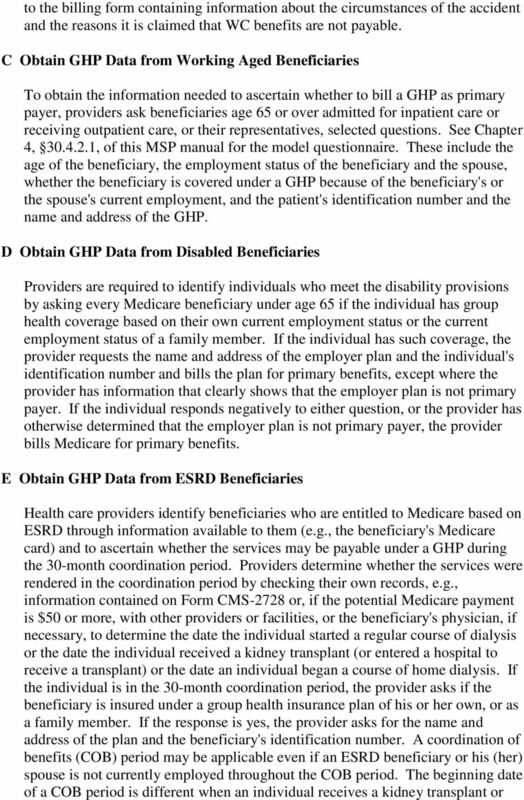 25, Issued: , Effective: , Implementation: ) General Policy Based on the law and regulations, providers, physicians, and other suppliers are required to file claims with Medicare using billing information obtained from the beneficiary to whom the item or service is furnished. Section 1862(b)(6) of the Act, (42 USC 1395y(b)(6)), requires all entities seeking payment for any item or service furnished under Part B to complete, on the basis of information obtained from the individual to whom the item or service is furnished, the portion of the claim form relating to the availability of other health insurance. 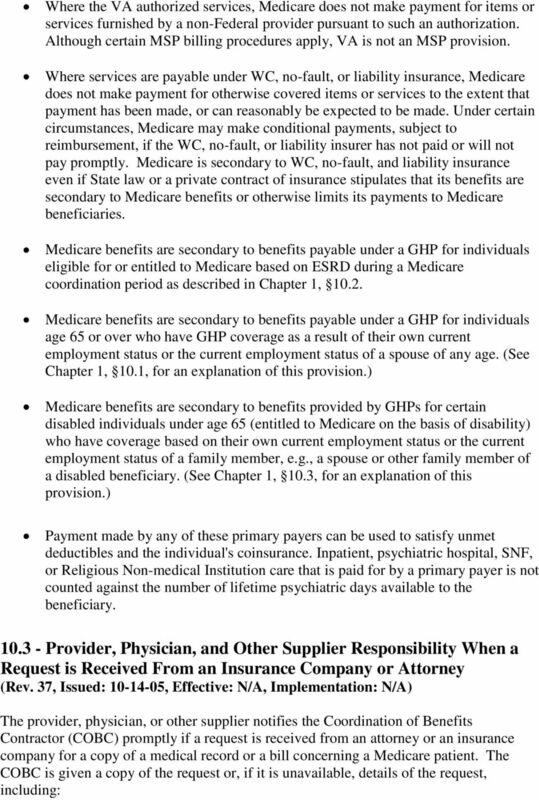 Additionally, 42 CFR (g) requires that all providers must agree to bill other primary payers before billing Medicare." Thus, any providers, physicians, and other suppliers that bill Medicare for services rendered to Medicare beneficiaries must determine whether or not Medicare is the primary payer for those services. This must be accomplished by asking Medicare beneficiaries, or their representatives, questions concerning the beneficiary's MSP status. Exceptions to this requirement are discussed below in 1 and 3. If providers, physicians or other suppliers fail to file correct and accurate claims with Medicare, and a mistaken payment situation is later found to exist, 42 CFR permits Medicare to recover its conditional or mistaken payments. 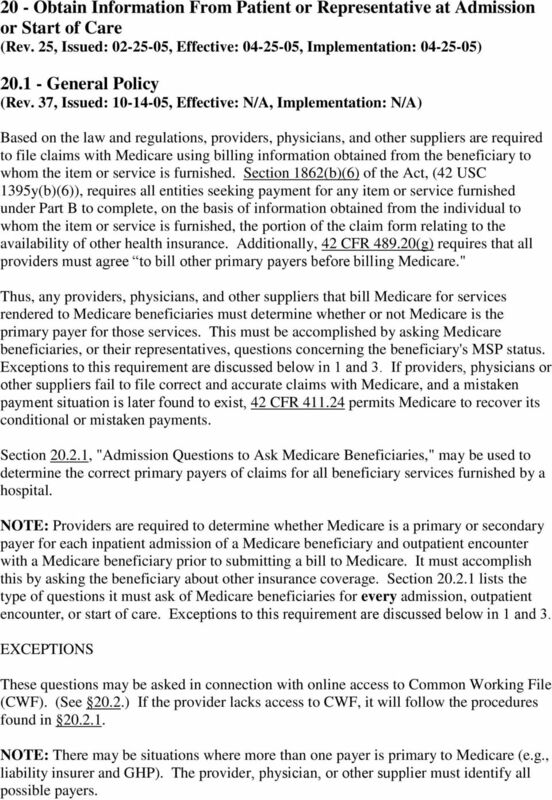 Section , "Admission Questions to Ask Medicare Beneficiaries," may be used to determine the correct primary payers of claims for all beneficiary services furnished by a hospital. 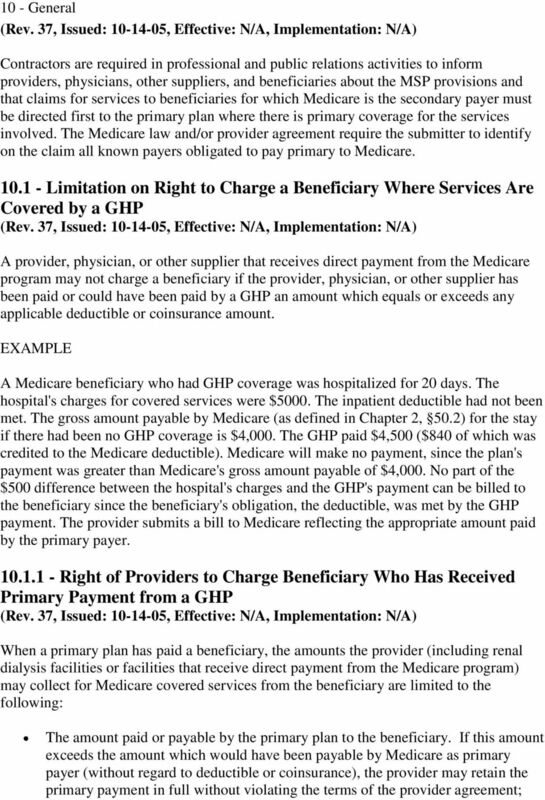 NOTE: Providers are required to determine whether Medicare is a primary or secondary payer for each inpatient admission of a Medicare beneficiary and outpatient encounter with a Medicare beneficiary prior to submitting a bill to Medicare. It must accomplish this by asking the beneficiary about other insurance coverage. 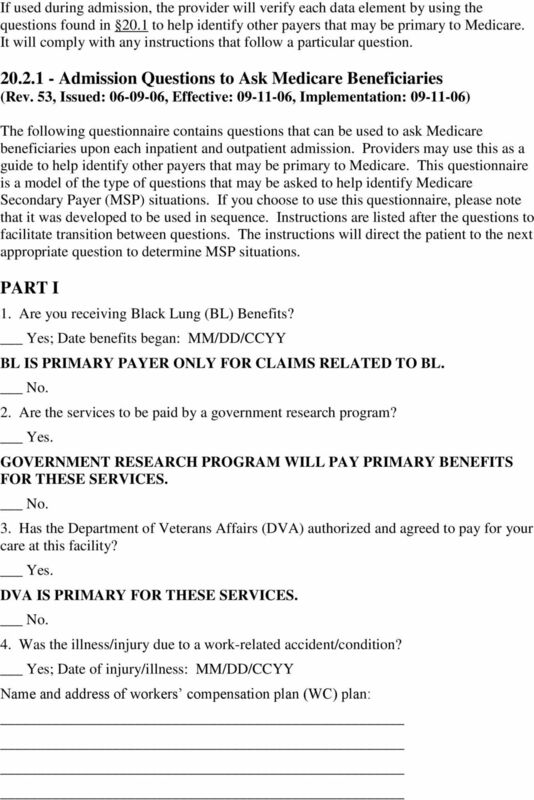 Section lists the type of questions it must ask of Medicare beneficiaries for every admission, outpatient encounter, or start of care. Exceptions to this requirement are discussed below in 1 and 3. EXCEPTIONS These questions may be asked in connection with online access to Common Working File (CWF). (See 20.2.) If the provider lacks access to CWF, it will follow the procedures found in NOTE: There may be situations where more than one payer is primary to Medicare (e.g., liability insurer and GHP). The provider, physician, or other supplier must identify all possible payers. 10 This greatly increases the likelihood that the primary payer is billed correctly. Verifying MSP information means confirming that the information previously furnished about the presence or absence of another payer that may be primary to Medicare is correct, clear, and complete, and that no changes have occurred. 1. Policy for Hospital Reference Lab Services and Independent Reference Lab Services Background Section 943 (TREATMENT OF HOSPITALS FOR CERTAIN SERVICES UNDER MEDICARE SECONDARY PAYER (MSP) PROVISIONS) of the Medicare Prescription Drug, Improvement & Modernization Act of 2003 states: (a) IN GENERAL. 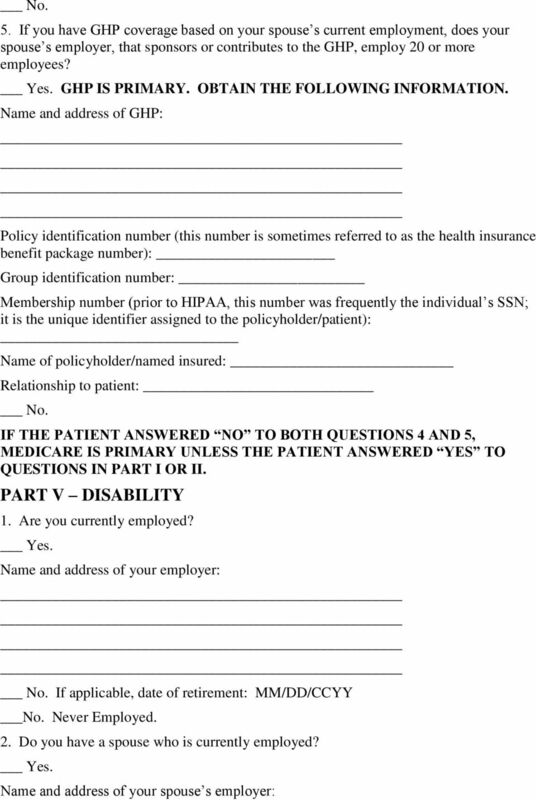 The Secretary shall not require a hospital (including a critical access hospital) to ask questions (or obtain information) relating to the application of section 1862(b) of the Social Security Act (relating to Medicare Secondary Payer provisions) in the case of reference lab services described in subsection (b), if the Secretary does not impose such requirement in the case of such services furnished by an independent laboratory. (b) REFERENCE LABORATORY SERVICES DESCRIBED. Reference laboratory services described in this subsection are clinical laboratory diagnostic tests (or the interpretation of such tests, or both) furnished without a face-to-face encounter between the individual entitled to benefits under part A or enrolled under part B, or both, and the hospital involved and in which the hospital submits a claim only for such test or interpretation. 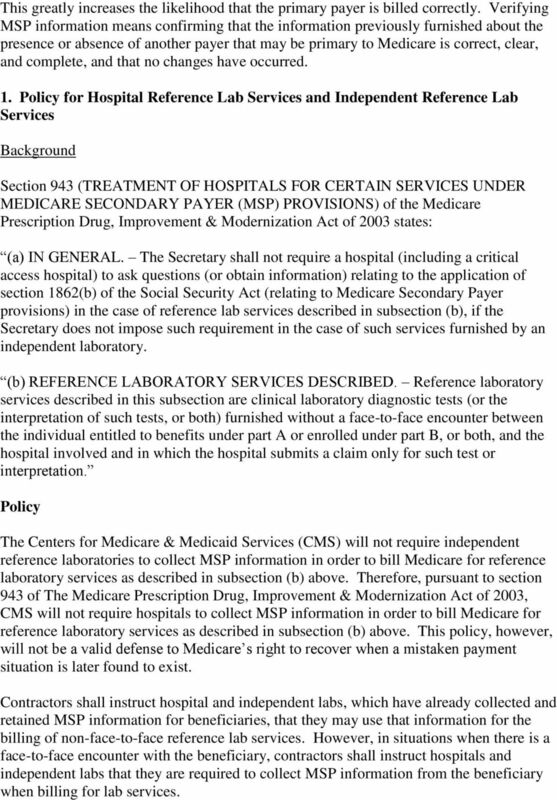 Policy The Centers for Medicare & Medicaid Services (CMS) will not require independent reference laboratories to collect MSP information in order to bill Medicare for reference laboratory services as described in subsection (b) above. Therefore, pursuant to section 943 of The Medicare Prescription Drug, Improvement & Modernization Act of 2003, CMS will not require hospitals to collect MSP information in order to bill Medicare for reference laboratory services as described in subsection (b) above. This policy, however, will not be a valid defense to Medicare s right to recover when a mistaken payment situation is later found to exist. Contractors shall instruct hospital and independent labs, which have already collected and retained MSP information for beneficiaries, that they may use that information for the billing of non-face-to-face reference lab services. However, in situations when there is a face-to-face encounter with the beneficiary, contractors shall instruct hospitals and independent labs that they are required to collect MSP information from the beneficiary when billing for lab services. 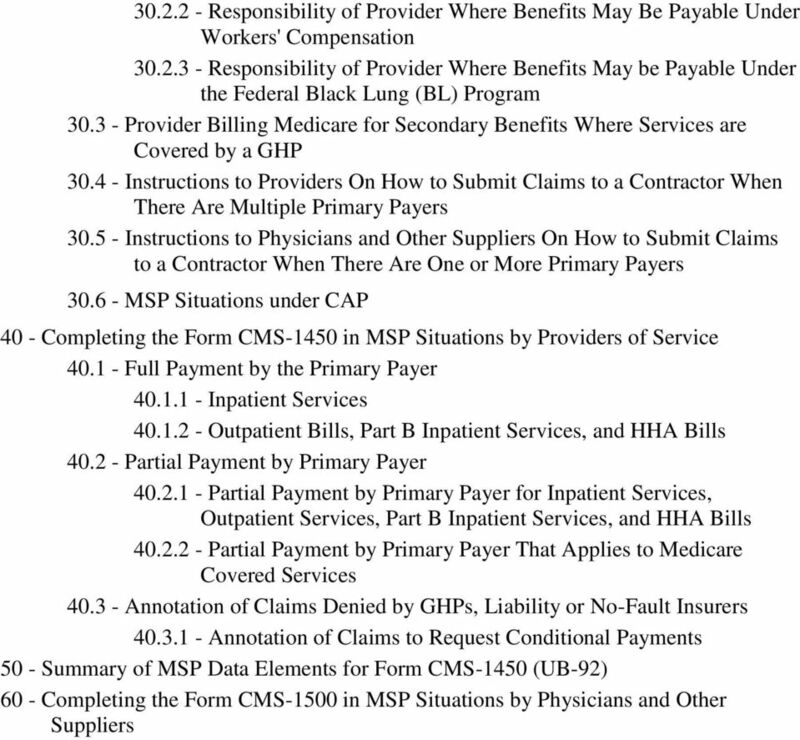 11 Instructions to contractors on how to process reference lab claims submitted on Form CMS-1500 are available by clicking on the following hyperlink: (After you get to chapter 26, click on section 10.2 in the Table of Contents.) 2. Policy for Recurring Outpatient Services Hospitals must collect MSP information from the beneficiary or his/her representative for hospital outpatients receiving recurring services. Both the initial collection of MSP information and any subsequent verification of this information must be obtained from the beneficiary or his/her representative. Following the initial collection, the MSP information should be verified once every 90 days. 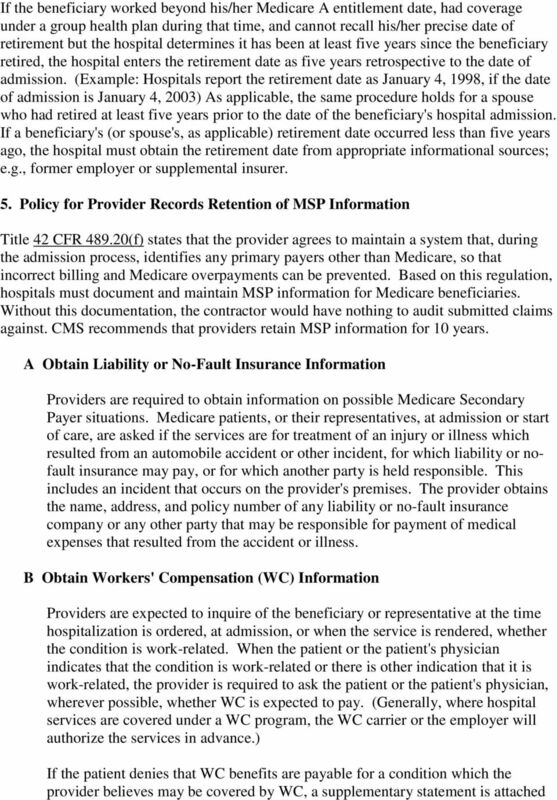 If the MSP information collected by the hospital, from the beneficiary or his/her representative and used for billing, is no older than 90 calendar days from the date the service was rendered, then that information may be used to bill Medicare for recurring outpatient services furnished by hospitals. This policy, however, will not be a valid defense to Medicare s right to recover when a mistaken payment situation is later found to exist. NOTE: A Medicare beneficiary is considered to be receiving recurring services if he/she receives identical services and treatments on an outpatient basis more than once within a billing cycle. 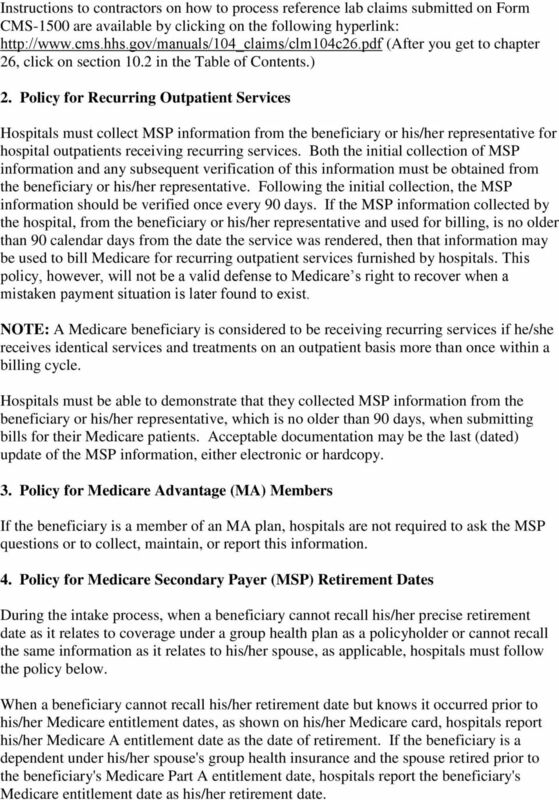 Hospitals must be able to demonstrate that they collected MSP information from the beneficiary or his/her representative, which is no older than 90 days, when submitting bills for their Medicare patients. Acceptable documentation may be the last (dated) update of the MSP information, either electronic or hardcopy. 3. Policy for Medicare Advantage (MA) Members If the beneficiary is a member of an MA plan, hospitals are not required to ask the MSP questions or to collect, maintain, or report this information. 4. 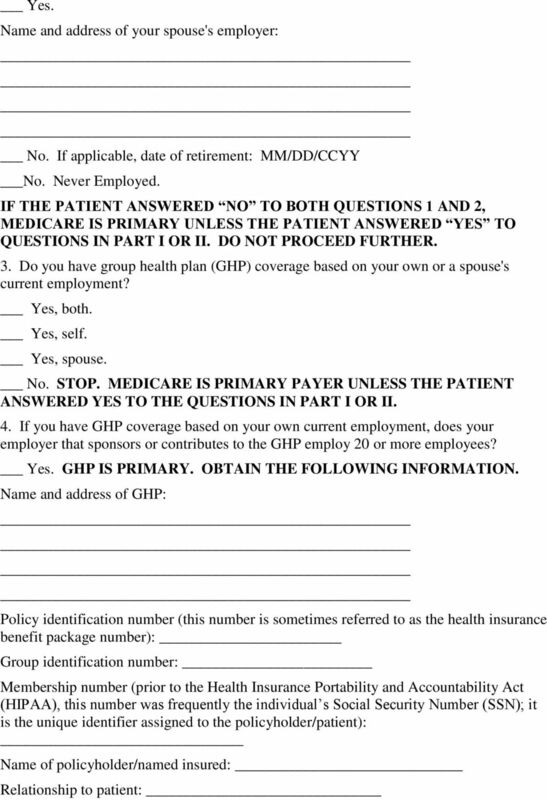 Policy for Medicare Secondary Payer (MSP) Retirement Dates During the intake process, when a beneficiary cannot recall his/her precise retirement date as it relates to coverage under a group health plan as a policyholder or cannot recall the same information as it relates to his/her spouse, as applicable, hospitals must follow the policy below. When a beneficiary cannot recall his/her retirement date but knows it occurred prior to his/her Medicare entitlement dates, as shown on his/her Medicare card, hospitals report his/her Medicare A entitlement date as the date of retirement. If the beneficiary is a dependent under his/her spouse's group health insurance and the spouse retired prior to the beneficiary's Medicare Part A entitlement date, hospitals report the beneficiary's Medicare entitlement date as his/her retirement date. 14 receives home dialysis than when an individual receives regular (outpatient) dialysis (3-month waiting period). If the information obtained does not indicate GHP coverage, the provider annotates the bill to that effect (e.g., GHP coverage lapsed, benefits exhausted). 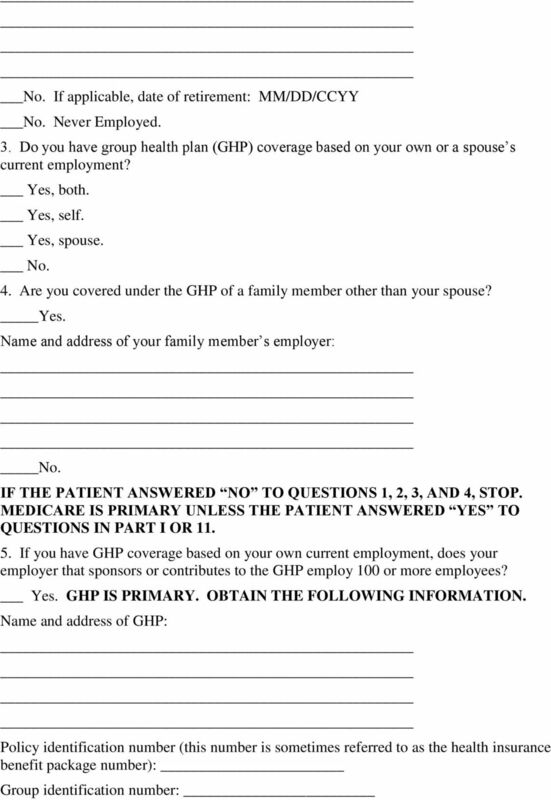 If the information indicates that GHP coverage exists, the provider obtains the information indicated above from the beneficiary or the beneficiary's representative. For audit purposes, and to ensure that the provider has developed for other primary payer coverage, the provider retains a record of the development or other information on which it based its determination that Medicare is primary payer. 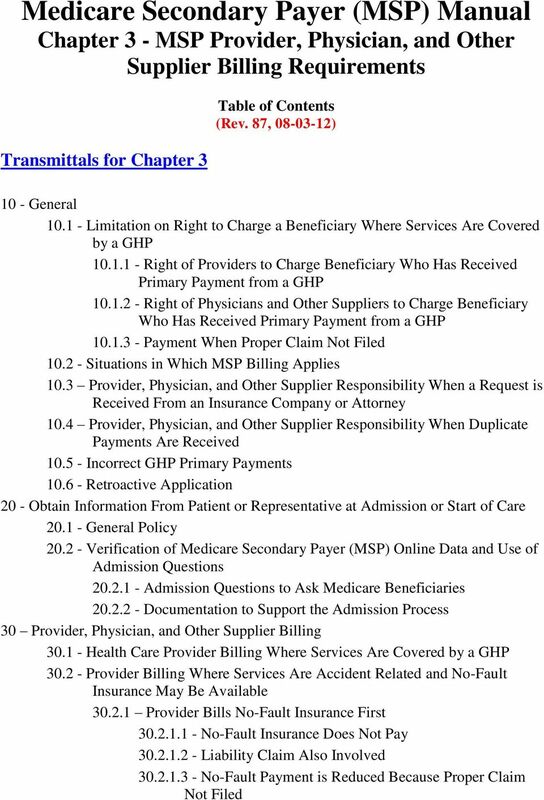 See Chapter 5, 30, for action to take where a claim is received for primary benefits and there is reason to believe that Medicare may be secondary payer Verification of Medicare Secondary Payer (MSP) Online Data and Use of Admission Questions (Rev. 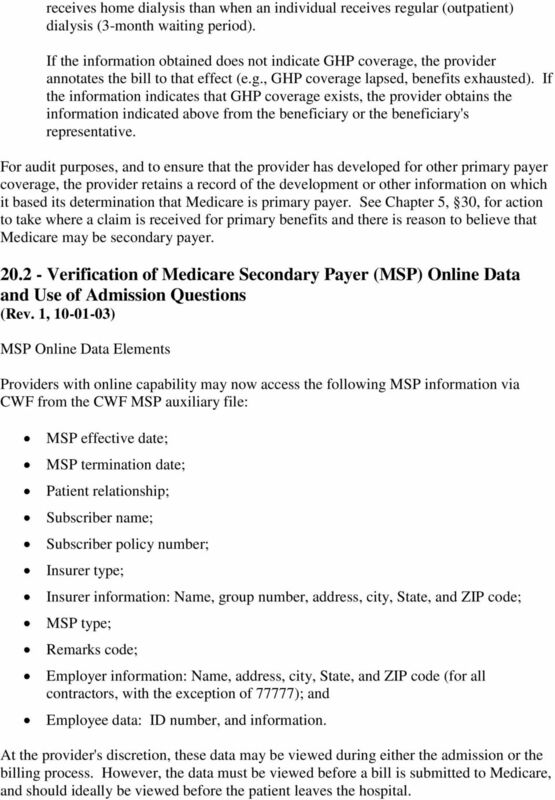 1, ) MSP Online Data Elements Providers with online capability may now access the following MSP information via CWF from the CWF MSP auxiliary file: MSP effective date; MSP termination date; Patient relationship; Subscriber name; Subscriber policy number; Insurer type; Insurer information: Name, group number, address, city, State, and ZIP code; MSP type; Remarks code; Employer information: Name, address, city, State, and ZIP code (for all contractors, with the exception of 77777); and Employee data: ID number, and information. At the provider's discretion, these data may be viewed during either the admission or the billing process. However, the data must be viewed before a bill is submitted to Medicare, and should ideally be viewed before the patient leaves the hospital. 17 Insurance claim number(s): No. 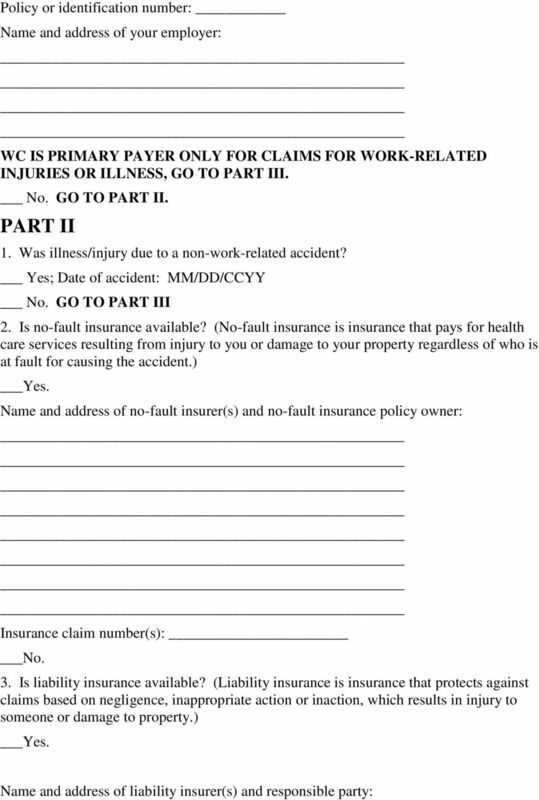 NO-FAULT INSURER IS PRIMARY PAYER ONLY FOR THOSE SERVICES RELATED TO THE ACCIDENT. LIABILITY INSURANCE IS PRIMARY PAYER ONLY FOR THOSE SERVICES RELATED TO THE LIABLITY SETTLEMENT, JUDGMENT, OR AWARD. GO TO PART III. PART III 1. Are you entitled to Medicare based on: Age. Go to PART IV. Disability. Go to PART V. End-Stage Renal Disease (ESRD). Go to PART VI. Please note that both Age and ESRD OR Disability and ESRD may be selected simultaneously. An individual cannot be entitled to Medicare based on Age and Disability simultaneously. Please complete ALL PARTS associated with the patient s selections. PART IV AGE 1. Are you currently employed? Yes. Name and address of your employer: No. If applicable, date of retirement: MM/DD/CCYY No. Never Employed. 2. Do you have a spouse who is currently employed?